Price for Non-Members: $25 if registered by December 5, $30 after. Join us for a blissful 2-hour workshop that will guide you through a series of restorative postures and teach you how to creatively use props to facilitate an experience of conscious, wakeful relaxation – promoting health and ease in the mind and body. Workshop Cancellation Policy: There are no refunds. Cancellations made by 5:00p on the day prior to the workshop will receive a studio credit toward services (not retail product) for the amount paid. Cancellations made after 5:00p on the day prior to the workshop will not receive a refund or credit. Price for Non-Members: $25 if registered by November 14th, $30 after. Learn proven techniques for concentration and visualization to help you envision and reach your goals in life. This 2-hour workshop is led by Sujantra who has offered these techniques to over 25,000 people in 21 countries around the world. Find more freedom, fluidity, and awareness in this hip opening workshop! Explore a variety of poses that will help release long-held tension and stress, and create easier movement in the body. Awaken the intelligence and wisdom of the body through asana! Pilgrimage of the Heart yoga studio is delighted to present and evening of Enchanting Indian Music with world renowned vocalist/instrumentalist Rahis Khan, joined by internationally revered Shambhu on the guitar. 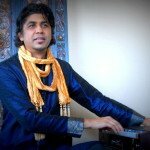 Rahis Ahmed Khan is a masterful vocalist and harmonium player and an eighth-generation musician from Jaipur, Rajashtan. He is trained in the art of ghazals: the poetic expression of the pain of loss or separation and the beauty of love in spite of that pain. This form of music is ancient, originating in 6th-century, written by Persian mystics and poets. He is also versed in Ragas (Indian Melody Scales) and Taals (Indian Rythmn Patterns). A unique artist and musician able to transform the the ancient poetry into modern-day musical presentations which take the listener on a journey and conveys the message love. Shambhu’s CD, Dreaming of Now, won a ZMR Music Award for Best Contemporary Instrumental Album of the Year (2014). An accomplished guitarist and composer, expressing himself through a blend of folk, Indian and jazz styles, Shambhu has performed or recorded with noted artists such as Carlos Santana, Premik Tubbs, Tony Levin, George Brooks and Whitney Houston. Shambhu plays Taylor Guitars. Rahis and Shambhu will be accompanied by master tabla player pandit Suresh Kumar. $25 if registered by 9/27, $30 after. The concept of ‘balance’ shows up in our yoga practice hundreds of ways. In this workshop, we’ll investigate some key principles that enable us to balance with more ease in yoga postures. We’ll also look at how to breathe in a way that keeps the nervous system calm and steady rather than over charged and revved up, laying the ground for greater psychological balance in our practice. And we will end with a little dharma talk, discussing how we as yogis can balance the aim of our practice both inwardly towards ourselves and outwardly toward the world. In the nature of this human experience it can be challenging to remain connected to ourselves amidst the busy happenings in the world around us. In this workshop we will have the opportunity to turn inwards getting know ourselves on deeper, more subtle levels in turn, giving us the tools to live in greater alignment and ultimately open the door to a more fulfilling, empowered life. $25 if registered by September 5, $30 after. Connect with your source of power as you deepen your practice from a place of strength and balance. This workshop will explore how to effectively use the core in various categories of asanas (postures) to create stability and freedom throughout the whole body. Expect a fun, invigorating, well-rounded practice complete with pranayama and meditation. Suitable for all levels of yogis. $25 if registered by August 8, $30 after. This two-hour workshop will focus on the benefits of twists: cleansing internal organs, stimulating circulation and restoring the spine’s natural range of motion. We will explore seated, standing, and supine twists, ending our practice with a sweet meditation and savasana. Price for Non-Members: $25 if registered by July 18, $30 after. 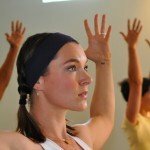 In this workshop we will not only gain better understanding of form and alignment in basic Yoga postures – answering questions like “am I doing this right” and “how is this posture supposed to feel?” We will also dive deeper into the benefits of these common yoga postures and how they positively affect us mentally, physically and energetically. This workshop will answer the “hows”, “whats” and “whys” of the yoga practice with time for questions as needed. This is the perfect workshop for those new to yoga and those looking to reconnect with fundamentals. 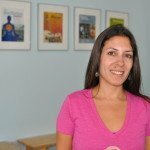 In this workshop you will connect with your Mama Tribe and learn baby massage techniques that can help with relaxation, digestion and bonding. You will also get back into your yoga practice with a sequence aimed at supporting the post­partum body. Finally, we will have some fun practicing a few simple and safe yoga poses with your baby. Come learn, play and connect! *Mother’s must be at least 6 weeks postpartum to attend, 8 weeks with C-section. Must have permission from OBGYN or Mid­wife. For babies, 6 weeks to crawling. Price for Non-Members: $25 if registered by June 13, $30 after. Welcome summer by joining the Pilgrimage of the Heart teachers through an exhilarating flow of 108 Sun Salutations! In this 2-hour practice, we’ll challenge ourselves, take breaks, and enhance our community at the studio. Ever heard the term “bandha” in your yoga class but are unsure of what that means or how to apply them? Or maybe you are a teacher who wants to expand your tools for teaching about the bandhas safely and effectively. In this class we will keep it simple and clear. We will begin by discussing theory, anatomy, and exploring the bandhas through simple exercises. With this awareness we will then move through an asana and pranayama practice, deepening our understanding while unlocking some of the keys to strength, posture, balance, breath control, and energetic transformation. Please notify the instructor if you are pregnant as some of the exercises are not recommended for pregnancy. Price for Non-Members: $25 if registered by May 2, $30 after. Learn to float with ease in multiple arm-balancing poses. 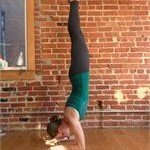 Create greater core, shoulder, arm and hand strength, and then have fun trying different variations of several arm balances. Arm balances can be the most challenging yet most rewarding part of your yoga practice. About Laura: Laura Dasi began practicing yoga in 1999 after having spent more than 20 years as a classical ballet and modern dancer. She was drawn to the flowing style of Vinyasa yoga not only for its physical benefits but also for the mental, emotional and spiritual freedom she felt after each class. With her vast knowledge of body mechanics and alignment principals from her years of dance training, Laura felt inspired to become a yoga instructor. 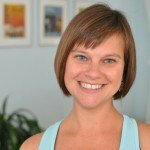 In 2002 she completed her teacher training and began incorporating her love of both dance and yoga into her teaching style. Her most influential teachers are Shiva Rea and Micheline Berry. Laura strives to make each of her classes a rhythmic, moving meditation allowing her students to develop flexibility, strength and grace as well as allowing them to find greater self-awareness and acceptance. Laura believes that yoga affects all aspects of one’s life and that with continued practice you will be able to relieve physical tension, mental anxiety, emotional burdens and energetic blockages leading to true happiness within yourself. Price for Non-Members: $25 if registered by April 11, $30 after. Find more freedom and fluidity in this hip opening workshop! Explore a variety of poses that will help release long-held tension and stress, and create easier movement in the body. Leave class feeling lighter and freer in your body. All levels welcome! 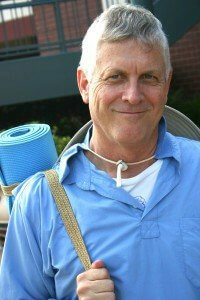 About Jackie: My journey on the path of Yoga began in 2005. After my first yoga class ever, I felt a sense of inner peace and rejuvenation that I had never experienced before. The physical practice of breathing and moving through asana brought me out of my mind and into my heart, and I felt a deep connection to my spiritual being. Yoga soon became a daily ritual to cleanse my mind, energize my body, and nourish my soul. This transformative practice has helped me break down barriers of ego and self-imposed limitations, and opens me up into a limitless pace of possibility where my spirit can thrive. I had to share this beautiful gift with the world! 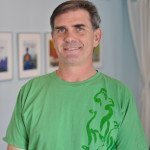 In 2009, I received my 200 hour RYT at Corepower Yoga, and I have been teaching and continuing to learn more about this ancient practice ever since. Through the powerful tools of deep breathing, music, and moving meditation, my classes are a creative fusion of elements to awaken your soul and ignite your spirit. I truly love witnessing others experience these beautiful transformations that occur on the journey of Yoga that we share, and it is my intention to help guide you, the student, on your path of healing, growth, and self-discovery in whatever way best serves You. Namaste. Price for Non-Members: $25 if registered by March 21st, $30 after. Wanna fly? Experience the basics of this exciting partner practice and feel confident practicing with friends and family. Come prepared to connect with your community, challenge yourself to trust, and enjoy the therapeutic benefit of being upside down! Longer description (if desired): Wanna fly? It’s as easy as it sounds! Join Britta Rael for an adventure in AcroYoga! Students will experience the basics of this exciting partner practice and feel confident practicing with friends and family. Yoga creates a stable foundation from which to explore the power of partner acrobatics and the loving-kindness of Thai massage. Come prepared to connect with your community, challenge yourself to trust, and enjoy the therapeutic benefit of being upside down! 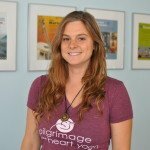 Teacher Bio: Introduced to yoga through the Isha Foundation in 2008, Britta studied Kriya, Hatha and several spiritual practices in southern India before completing her yoga teacher certification in 2011 with Bhava Ram at the Deep Yoga School of Healing Arts in San Diego. Based out of San Diego, California, Britta now distills the art of “redefining balance” through slacklining, yoga, and partner acrobatics. A certified YogaSlacker and AcroYoga teacher, she has studied with renowned teachers Jason Nemer, Jason and Chelsey Magness, Mara Harris and Lux Sternstein. 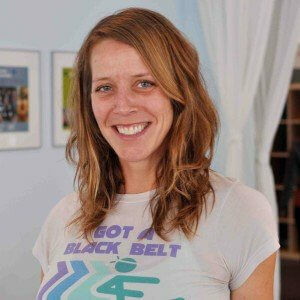 Britta’s rejuvenating teaching style allows students to connect with their inner guides through guided meditations, playful postures, and focused attention on the breath. She loves to balance out the dynamic nature of partner acrobatics with supported inversions and deep, healing Thai massage. Challenging relationships with those around us are part of the human experience. Discover how the meditation practices of mindfulness and loving-kindness can enrich your relationships with family, friends, colleagues, and even strangers. You’ll learn about the roots of these practices in the original teachings of the Buddha and what modern science tells us about how they work. 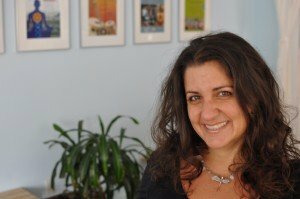 Rachel will guide you through mindfulness and loving-kindness meditations, and opportunities will be provided for reflection and discussion on how you can continue to practice these techniques in a way that can enhance your relationships. 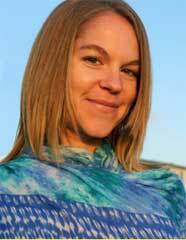 Teacher Bio: Rachel has been practicing yoga since the late 1990s and meditation since 2005. As a yoga practitioner and teacher, Rachel explores the connections between the physical practices of yoga (asana and pranayama) and the non-physical practices (including philosophy and meditation). Increasingly, mindfulness meditation has come to inform her practice and teaching of yoga. Rachel believes that yoga and meditation have great power to transform us, helping us open to change in our physical, mental, emotional and spiritual selves. She feels deeply privileged to be able to share these amazing teachings with others. Join us for this FREE event! Enjoy the sounds of original and traditional kirtans and bhajans. No reservations necessary. Doors open at 7:30p and free refreshments will be served. Price for Non-Members: $25 if registered by February 21st, $30 after. Starting with our heart’s intention, we will safely and gracefully open the spine, hips, and shoulders as we move into the joy that awaits us in backbends. Learn proper alignment through action and breath in this invigorating and energizing practice designed to open your heart to self-acceptance and compassion. All levels encouraged to attend. Teacher Bio: Jamie first stepped on a yoga mat the summer of 2004, in the heart of Columbia, SC. She was led to the practice by a desire to feel better and to find her true place in the world. A few years earlier, she had been diagnosed with leukemia and was having difficulty dealing with the many effects of the disease–physical, emotional and mental. 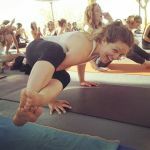 Yoga provided her with a much-needed outlet in a safe, nurturing space for her to be in her own body, as well as taught her resilience and patience in the face of chaos and uncertainty. With this 3-hour workshop, we will build a strong and progressive knowledge base in the foundational principles of Yoga in asana. Come join me for an afternoon of how aligning to the stability of our individual and perfect natures allows for the delight in BE-ing. 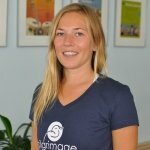 Teacher Bio: Nikole has a 200 hour certification from UCSD training with Arturo Galvez in the Iyengar & Astanga traditions, and recently completed a 100 hour interdisciplinary flow certification from Yoga One with Amy Caldwell & Diana Beardsley. 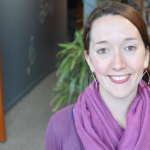 She’s been blessed to have studied with many amazing teachers, and often credits her students for teaching her most. In her classes, she likes to incorporate chanting, pranayama, Sanskrit, philosophy, still and moving meditation through asanas with emphasis on the breath so that students can experience the spectrum of transformational yoga expressions. Foremost, she encourages students to practice loving kindness, truth, peace and acceptance on the mat as these qualities invariably translate into life. We all transmit, receive and radiate subtle energies and when tapped into they can enliven our system and provide rich insight as to how we connect with ourselves, others and the world around us. Open to all and no experience necessary. Price for Non-Members: $25 if registered by January 11, $30 after. Inverting gives a fun and healthy flip to our perspectives! In this workshop, you will learn step by step techniques for safely going upside down. The workshop includes an asana (posture) practice to prepare the body and mind, as well as a long, sweet savasana. Price for Non-Members: $25 if registered by December 6th, $30 after. Join us for a blissful 2-hour workshop that will include guided relaxation and a series of restorative postures. Aiming to relieve the stress and excess energy that can build up around the holidays, this workshop will leave you feeling recharged, refreshed, and rejuvenated. It is truly a gift to the self! 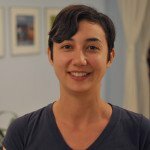 Kayma Englund is an E-RYT 500, Reiki Master and Thai Massage Practitioner with a deep passion for sharing the therapeutic effects of Yoga. She has devoted her life and over 1,000 hours of organized training to study and explore these ancient teachings to ultimately serve and enhance the well-being of each individual and the planet. 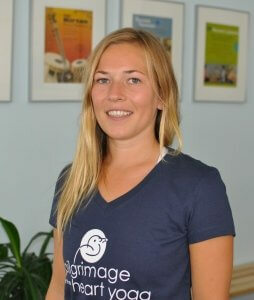 She is excited to share the countless benefits of a Restorative Yoga with the Pilgrimage community! Price for Non-Members: $25 if registered by November 15th, $30 after. Tap into the strength at the core of your being in this upbeat, all-levels workshop! Designed to get you tuned in to your personal power and gut instincts while toning and tightening, this workshop includes warm-up asanas, practical and fun abdominal exercises, discussion, and relaxation. Energizing playlist guaranteed! ZMR award winning composer and guitar virtuoso performing material from his new album ‘Dreaming of Now’, “a musical masterwork that sets a new standard for music.” – Music and Media Focus. No reservations necessary. Price for Non-Members: $25 early registration, $30 after 11/1/14. 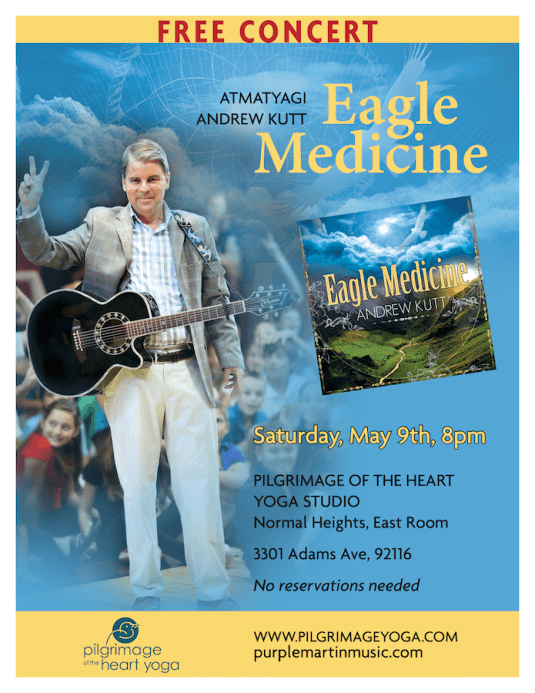 Discover Kundalini Yoga and Meditation as an in-the-body spiritual experience for personal transformation through opening your heart and spirit. Be prepared for the bliss that comes from uniting your heart and spirit and taking that presence into the world! 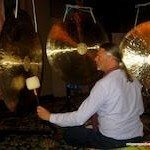 Includes Symphonic Gong meditation. A strong yoga practice begins with strong foundations! This workshop will offer you the chance to strengthen your practice through the creation of a strong connection with your hands and feet. You will experience how to use postures, mudras and pranayama to realign for greater health and more stability in your practice. In the season of autumn we are reminded to balance all parts of ourselves. By surrendering to the magic of your practice we will unify the logical and the intuitive, the active and the passive, the known and the unknown. Embrace this beautiful season and allow its theme of inner reflection to encourage new doors to open as well as new directions and possibilities to reveal themselves. Please bring a yoga mat, journal, pen & water as well as personal power objects for meditation. Yin Yoga is a style of yoga gaining more and more recognition for its relevance worldwide. It is a meditative practice that safely stresses the connective tissue of the body, leading to greater range of motion and flexibility, less pain and stiffness from overuse and injury, and increased mindfulness, patience, and acceptance. Most forms of asana today (the poses) are very “Yang” – active practices that work the muscles and organs of the body. Yin is a quiet, slow and grounded practice that balances the Yang activity. It brings health to the dense tissues of the body – the joints, bones, and fascia. In essence, it is essential for a balanced practice. Yin Yoga is highly effective, and the demand for quality Yin Yoga teachers is on the rise. This program will draw you deeper into the empowering practice of Yin yoga in a way that is safe, accessible, and purposeful. You will learn techniques to safely practice and lead others with intelligent and therapeutic sequencing for the feet, legs, hips, spine, shoulders, hands, and skull. Open to all yoga teachers, health practitioners, and students with approval from instructor. All students must take 2 group Yin classes at POTH during the 2 week time period of the course. At the end of this program, participants will receive a certificate of completion to honor their efforts. 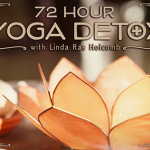 This program may be used for 21 Continuing Education Credits with Yoga Alliance. 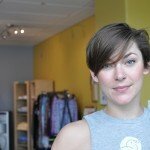 Shelby has over 3,200 hours of in-class yoga teaching experience. 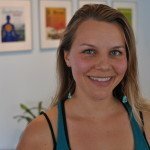 Two years after an accident that resulted in the severe hyper extension of her entire spine she had the great fortune of enrolling in a teacher training program that included Yin yoga with internationally renowned teacher Paul Grilley, positively changing her practice, body and mind forever. Price for Non-Members: $25 if registered by 8/9/14; $30 after. This workshop is a laboratory for compassionate exploration. Through lecture, demonstration and practice, we will uncover pathways to greater physical freedom and less pain. Setting the foundation for our asana practice, will look at the basic anatomy and alignment of the lower body, including proper joint mobilization and appropriate muscle action for healthy movement patterns. Then, fine tune your alignment within common standing and floor-based poses while learning some simple yet effective therapeutic tools for relieving pain in the moment, including any discomfort caused by a more active asana practice. Open to All levels and abilities, modifications will be provided. Learning objectives can be applied to any style of asana practice, exercise, and general life functions. Price for Non-Members: $25 if registered by 9/6/14; $30 after. Come join us for an afternoon of deep restoration, reorganization and clearing of your subtle energy systems. We are combining restorative yoga poses, Thetahealing™ mediation, and a four Chinese Feng (wind) gong immersion for a powerfully transformative experience. In the Theta state, the mind is capable of deep and profound learning, healing, and growth. It is the brain wave where our minds can connect to the Divine and manifest changes in the material world. Nikole Fortier, Certified ThetaHealer™ and Lead Teacher of Pilgrimage of the Heart’s Yoga Teacher Training, and Ken Goff, Healing Sound, Gong Master are excited to guide you on this memorable experience with a powerful combination of restorative yoga, Thetahealing and wind gongs focused in the spiritual eye, throat, solar plexus and sacral chakras. DETOX is a BUZZ word and it’s time for you to get in on the fun! This 72-Hour whole-foods-based cleanse is intended for people on the go and is a Nutrition Program you will embrace and practice for the rest of your life. With no surprises, supplements or food items you cannot pronounce, enjoy your morning cup of coffee and EAT AS MUCH AS YOU CAN for three days as you begin to look and feel your best! The Grocery Shopping List contains 100+ food items, all of which can be purchased at Trader Joe’s or your local co-op. 24-page Yoga Detox Program Guide which includes everything you need to know from start to finish to practice the cleanse…except for the actual food that is! With a Grocery List that details the Nutritional benefits and values of each food item, Daily Menus, Recipes galore including Smoothie Recipes, a Yoga Detox Pose Index, Ayurvedic secrets and much more, you will find this program extremely easy to shop for and to follow. Not a convenient weekend to Detox? Drop-in students are welcome at all classes. and will receive the Program Guide to practice the cleanse on your own time. In this workshop, students will practice finding the balance between strength and stability (sthira) and gentleness and grace (sukha) in various yoga poses. We will play with building grounded bases for our yoga poses and discover how that allows us to find freedom and flight within each pose and in optional challenge variations. Alongside the yoga asana, we will incorporate a discussion regarding how this balance between effort and ease on the mat can translate to our lives off the mat in daily activities, relationships, activism, finding a job, and everything in between. A little bit of elbow grease and a lot of letting go will take us to places beyond our wildest imaginations! As we move forward in our lives & our practice one of the biggest gifts we can give ourselves is to pause, reflect & encourage ourselves to feed Divine Light & Inner Peace within. In this workshop you will experience a deeper understanding of Pranayama (guided breathing) & the way in which our Asana (physical poses) allows us to surrender into this ancient ritual of steadying the temple of spirit through our sacred breath. Beautiful Mantra Post cards will inspire us to guide the creation of a personalized expression to take with us at the end of our time together. We will choose the asana expression card that best represents us & then enjoy journaling inside & creating personal mantra. Please bring a yoga mat, water & an open heart. Join the Pilgrimage of the Heart community for our next movie night featuring the film “Touch the Sound – A Sound Journey with Evelyn Glennie”. Evelyn Glennie is a Grammy-winning percussionist who has been deaf since childhood. This stirring documentary follows Glennie, who can only hear the very lowest level of sound, to a variety of locations–including the Scottish farm where she grew up, Grand Central Station, a rooftop pigeon coop, an airport, a beach, and more–where she uses the vibrations she feels throughout her body to make music. By learning Mindfulness, you will have the tools to find peace of mind and balance amidst your daily activities. Learn and experience the history, theory and practical techniques of Mindfulness that you can use everyday. Price for Non-Members: $25 if registered by 5/24; $30 after. Get ready for summer by building your inner fire and strength! Empower yourself with this 2 hour practice meant to elevate your heart rate, develop leg and core stability, and increase your vivacity! – Exercise & lifestyle choices for different phases of your cycle to feel your best! Price for Non-Members: $25 if registered by 4/19; $30 after. Deepen your understanding of healthy anatomical alignment and movement principles in this Yoga Therapy workshop for the upper body. 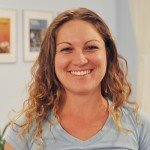 Learn new techniques to reduce pain and tension both from injury and over use, as well as tools to restore balance and freedom in the upper back, neck and shoulders. This class is open to all – including those who have been hesitant to return to their yoga mat due to injury and discomfort. Through asana, meditation, mantra, chakra awareness, and breath we will bring balance & radiance to the energies of body, mind & soul. – Energizing Hatha Yoga Asana & Pranayama will guide you into harmonizing lunar (feminine) and solar (masculine) energies for balance, power and healing. – Meditation encourages us to surrender to the present moment, allowing ourselves to be in the here & now, connecting to our intuitive guidance. – With a realization of the Divine Light within & with sacred mantras projecting from the heart, we can strive to develop new habits of self-love that enriches our lives. – Journey through the Chakras with awareness allowing the release of stagnate energies that no longer serve us, promoting free flowing prana, lightness & bliss. We will conclude this workshop with a short Yoga Nidra to seal our clearing & establish our intention for Spring. Please bring your yoga mat, journal, pen & water as well as personal power objects for the altar that we will create together for the workshop. Are you up for the challenge? 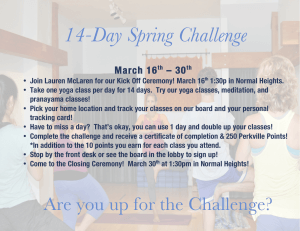 Join us for our Kick Off Ceremony and enjoy our Spring 14 Day Challenge! All you have to do is take one yoga class a day for 14 days. Try our yoga classes, meditation, and pranayama classes. They all count! Just pick your home location and track your classes on your studio’s board and your personal tracking card. Have to miss a day? That’s okay, you can use 1 day and double up on your classes. Once you complete the challenge you will receive a certificate of completion and 250 Perkville Points (in addition to the 10 points you earn for every class you attend)! Sign up for our Kick Off & Closing Ceremonies online and stop by the front desk & see the board in the lobby to sign up for the challenge! About the film: An overcrowded, violent maximum-security prison, the end of the line in Alabama’s prison system, is dramatically changed by the influence of an ancient meditation program. Behind high security towers and a double row of barbed wire and electrical fence live over 1,500 prisoners, many of whom will never again know life in the outside world. But for some of these men, a spark is ignited when it becomes the first maximum-security prison in North America to hold an extended Vipassana retreat, an emotionally and physically demanding program of silent meditation lasting ten days and requiring 100 hours of meditation. The Dhamma Brothers tells a dramatic tale of human potential and transformation as it closely follows and documents the stories of the prison inmates at Donaldson Correctional Facility as they enter into this arduous and intensive program. This film has the power to dismantle stereotypes about men behind prison bars. Ever heard the term “bandha” in your yoga class but are unsure of what that means our how to apply them? In this class we will keep it simple and clear. By discussing theory, anatomy, and through discovery in asana practice, begin to unlock some of the keys to strength, breath control, energetic transformation and awareness. Introduce and clearly explain the 3 main bandhas – jalandhara, uddiyana, and mula bandha. Discuss basic philosophy regarding bandhas, physical and energetic anatomy, and practice of practical application within asanas. – A deeper understanding and appreciation for their anatomy, including clear explanation of potential and kinetic energetic exchange as result of applying bandhas. 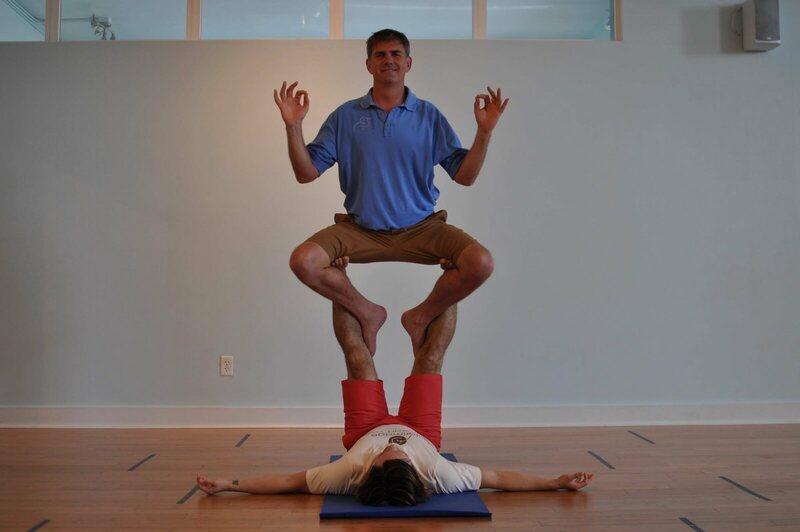 Yoga Instructors: Workshop will qualify for 3 CEUs with Yoga Alliance. Price for Non-Members: $25 if registered by 3/1/14; $30 after. “YinYang” begins with a fiery “Yang” (vinyasa) practice to build heat in the body. This heat prepares the body to then melt deeply into a luscious hour of “Yin” (restorative, deep release) and Yoga Nidra, or yogic sleep. It is said that one hour of Yoga Nidra is equal to four hours of normal sleep and is the secret of great yogis both today and in the past. Price for Non-Members: $25 if registered by 2/15; $30 after. A journey into the inner bodies through the unique gift of yoga called MIMSY – Meditation in Movement Style Yoga. Lanita will lead you through a series of floor based asanas that could easily be called “Yoga for Your Back,” but the unique way it is intuitively led also awakens your inner bodies and releases deep tension away from hips, the spine, and your mind. This is a great class for anyone new to yoga who can easily lie on the floor, and a very important balance for students who do only active yoga or cannot do yin or restorative yoga. Lanita’s teachings will guide you through yoga’s most beneficial breathing techniques, ethics, and chakras in an easy, Americanized way. This style of yoga feels easy but is deceptively deep. It may be the hardest class a more active student of yoga will ever do, for in this style of yoga it is not about how much you can do, but how much you can let go. 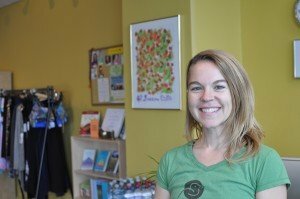 Lanita Varshell is the owner of “A Gentle Way Yoga & Joyful Movement Center. She has inspired others by teaching yoga full time since 1996, despite a body plagued with health and weight challenges. She is the creator of MIMSY- A unique style of yoga that is very easy to practice but deceptively deep. This style of yoga has helped her and thousands of students realize that everything we are seeking can only be found within, and helps us unlock the doors within to access our hidden potential and attract like-minded loving relationships and friends. 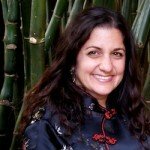 Lanita teaches at A Gentle Way Yoga, at Feathered Pipe Retreat Center in Montana, & Kripalu Yoga Retreat Center in Mass.She has been interviewed by several yoga publications including L.A. Yoga and Yoga Journal. She leads our Teacher Training and Yoga Therapy Workshops in San Diego, and guest teaches at other Studios throughout the United States. She served on the board of Y.E.S. 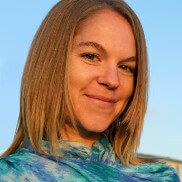 (Yoga Teachers Education Society) for five years, and was the founder and director of the Yoga Hotline. She produces CDs and DVDs; trains teachers; teaches special workshops on Yoga for the plus sized and health challenged; and was a presenter at the International Yoga Conference 2002 in San Diego, hosted by IDEA and Yoga Journal. She has been featured in Yoga Journal (December 2000), The San Diego Union-Tribune, The Daily Californian, CBS News, KUSI Channel 51, and many other media outlets. Price for Non-Members: $25 if registered by 1/11; $30 after. Fly into the new year with one of Pilgrimage’s most unique offerings, AcroYoga (Montreal-style). This workshop is geared towards new and first time students (though experienced students are welcome to join) as we explore the basics of body balance and dynamic partner yoga. Its one of the few practices that will have you laughing while breaking a sweat. No partner or experience necessary. 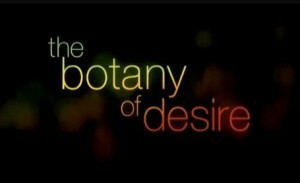 About the film: Featuring Michael Pollan and based on his best-selling book, this special takes viewers on an eye-opening exploration of the human relationship with the plant world — seen from the plants’ point of view. Narrated by Frances McDormand, the program shows how four familiar species — the apple, the tulip, marijuana and the potato — evolved to satisfy our yearnings for sweetness, beauty, intoxication and control. In this workshop we encourage connection to our true nature of inner peace by embracing the harmony and unity of body, mind, and spirit. – Explore visualization, meditation, purification and breathing practices to recharge your soul. 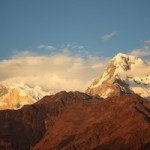 – Engage in the practice of Yoga Nidra: deep yogic sleep with conscious awareness. – Practice gentle asana (yoga poses) to encourage balance, flexibility, and relaxation. – Embrace the art of intention & goal setting for a prosperous & joyful year. Please bring a yoga mat, journal, pen, water, cozy clothing, and an open heart.